Contrary to popular belief, the discovery of the chemical structure and biological function of deoxyribonucleic acid (DNA) did not occur within the past several years and was not accomplished by a small select group of scientists. In fact, the building of Watson and Crick's famous double, helical model of the DNA molecule was an achievement whose lineage could be traced back through the previous century. This fascinating and highly readable account does just that; beginning with Friedrich Miescher's isolation of "nuclein" in 1869 and culminating with Marshall Nirenberg's formulation of the genetic code almost 100 years later. Why did information about DNA's structure and function lag so far behind its isolation as a substance? The main reason, of course, was the inadequacy of the nineteenth and early twentieth century technology for the study of substances at a molecular level. A student at the most basic high school laboratory today has far more sophisticated equipment - such as a microscope without optical aberrations - than Miescher ever had. Each new advance in analytic techniques - staining, centrifugation, X-ray crystallography - opened up new areas of information and suggested further possibilities for research. But this is more than an academic history. It is also the objectively told story of the researchers themselves their motivations, prejudices, egotism, loyalties-in short, all the human factors that sometimes serve to spur research on.and sometimes impeded it. Like people everywhere, they made miscalculations, forgot important data, overlooked obvious techniques, or became bogged down in a rigid way of thinking. They had flashes of insight while commuting or lying in bed with a cold. Chance or mutual friends brought together some of the century's most effective research teams; personal animosities divided others. The wealth of anecdotal material gathered here makes "A Century of DNA" as exciting to the interested layman as to the scientist. First row: E. H. Haeckel, E. L. Tatum, R. W. Holley, W. His, M. W. Nirenberg, A. Weismann. Second row: A. D. Hershey, F. Hoppe-Seyler, F. H. C. Crick, S. E. Luria, G. J. Mendel, S. Ochoa. Third row: M. Delbruck, J. D. Watson, K. W. von Nageli, A. R. Todd, W. Flemming, F. Miescher. Fourth row: O. T. Avery, C. R. Darwin, G. W. Beadle, H. De Vries, W. L. Bragg, M. McCarty. Why write a book about DNA? The answer, presented in the next thirteen chapters, is that the story of DNA from the time of its discovery in 1869 up to the solution of the genetic code in the 1960s is one of the most fascinating of modern science. Despite the efforts of many scientists, understanding of the chemical structure and biological function of DNA evolved slowly and in many unexpected ways. In fact, it has taken more than a century of work to solve these problems, and often unexpected information continues to accumulate. From the start of this century through the 1940s, DNA was generally considered to be a small molecule made up of only four smaller units termed nucleotides. It was also thought to be of only marginal biological importance. Subsequent work showed that DNA was actually one of the largest of naturally occurring molecules, containing many thousands of nucleotides, and that it was of the utmost genetic significance. Ultimately, in 1953, two young scientists - James Watson and Francis Crick - proposed a model for the physical structure of DNA that so profoundly altered man's view of nature that the eminent geneticist C. H. Waddington described their work as "certainly the greatest discovery in biology in this century. "1 Our intention has been to write a history of research on DNA from its initial discovery through the present in which the later discoveries are properly placed in perspective relative to the earlier ones. We have tried to write an account that is comprehensible to the general reader as well as to the professional scientist and historian of science. The chemical structure and biological function of DNA encompass subjects of a highly technical nature. Although we have tried to explain all technical matters in the text, we have also assumed that the reader has an elementary knowledge of chemistry and biology equivalent to what is now taught in high schools. In order to present this history, covering more than a century of scientific investigation in a half dozen or more scientific disciplines, in an interesting and readable fashion, we have found it necessary to sacrifice some details that might be of interest only to the professional historian of science. Unfortunately, we have not been able to fully review the work of some of the earlier chemists, such as Robert Feulgen and Ivor Bang. We have also chosen not to cover certain areas in detail, notably the chemistry of purines and pyrimidines, the structural work on nucleosides, and some of the later work on RNA. However, we have included work on RNA and protein where we felt these to be directly relevant to the main theme of DNA. In this sense, therefore, we have written neither a totally detailed history nor a strictly academic one. Two recent books by Joseph Fruton2 and Robert Olby3 each in its own way perform these more intricate functions. Fruton's book, "Molecules and Life", is a general history of biochemistry and provides a framework into which the work on DNA can be fitted. Olby's book, "The Path to the Double Helix", concentrates on the research that used X-ray diffraction methods to solve problems of complex molecular structure, in particular the structure of DNA. The organization of our book is based on the answer to a single question: Why did it take more than a century of research before scientists properly understood what DNA was and what it did within the cell? The book does not adhere to the point of view of a single scientific discipline but traces the problem across interrelated subjects, mirroring actual development of the DNA field. DNA, by this treatment, is shown to be not just an outstanding problem in the history of biochemistry but one of importance to diverse fields such as embryology, biophysics, organic chemistry, histology, physiological chemistry, genetics, and so forth. The chapters, as far as possible, follow a chronological sequence in the development of ideas on DNA. We have tried to present these ideas as scientists at the time regarded them, rather than evaluating them with hindsight. Our purpose is to show the important developments in the area and their effect regardless of whether subsequent events proved them to be in error. Our rationale is that this is the way the field actually progressed, as do almost all areas of research, rather: than in a straight line from one substantiated observation to another. We have incorporated biographical material on each of the major contributors to the work under discussion. Biographical details are important in trying to determine why a certain scientist becomes the first among his contemporaries to make a specific discovery, and to what extent the discovery is due to chance. Science has become much more institutionalized in the past hundred years, yet some of these factors may be just as pertinent to discovery in the twentieth century as they were when Friedrich Miescher discovered nuclein in 1869. We hope these biographical details demonstrate that science is not a purely abstract activity devoid of human relationships, but is rather a human exercise in which individuals act and interact. In order to authenticate some aspects of the work on DNA and to provide a flavor of the times, we have carried out interviews with a number of participants in that work. However, we do not regard the results of these conversations as necessarily representing the actual course of historical events. As Saul Benison, the eminent historian of science, has said, "In an important sense oral history is misnamed. While it is true that the oral historian helps to gather an oral memoir, it is equally true that this account is based on a written record. "4 To write an account of the history of DNA at this time is clearly not an easy proposition. In Erwin Chargaff's words, "It must be very difficult as long as some of the witnesses, with all their quirks, senilities and dubious recollections are still alive. "5 We have, of course, attempted to include original information wherever possible, as in the use of some original German material on Friedrich Miescher (Chapter 1), in one of the first extensive accounts of the history of the chemistry of DNA (Chapters 4 and 9)6 in the discussion of the work of Avery and his associates on genetic transformation by DNA (Chapter 7)7 and in the description of the work on the genetic code (Chapter 12). One may legitimately ask if knowledge of how this subject developed will in any way help those who continue research on molecular genetics. We would only offer the comment that there is no indication from this history that "schools" or organized "campaigns" have an increased chance of success in producing breakthroughs, since the breakthroughs on DNA have come in such unpredictable and varied circumstances. In a more general sense, knowledge of science and technology is not essential to most people, and indeed many young people today reject science as too austere and rational for their tastes. It is not necessary to understand the laws of aerodynamics or the operation of a jet engine to fly in an airplane, just as it is not necessary to understand genetics or DNA to reproduce. Yet surely, of all man's discoveries since the Age of Reason, none should fascinate us more than the endeavor to understand the mystery of the basis of life. References 1. C. H. Waddington, "Some European Contributions to the Prehistory of Molecular Biology," Nature 221,318-321 (1969). 2. J. S. Fruton, Molecules and Life, Wiley-Interscience, New York, 1972. 3. R. Olby, The Path to the Double Helix, Macmillan, London, 1973; University of Washington Press, Seattle, 1974. 4. S. Benison, "Oral History-A Personal View," Proceedings of the Conference on the History of Biochemistry and Molecular Biology, American Academy of Arts and Sciences, Boston, May 1973, p. 100. 5. E. Chargaff, quoted in M. R. Pollack, "The Discovery of DNA: An Ironic Tale of Chance, Prejudice and Insight," J. Gen. Microbiol. 63, 1 (1970). 6. J. S. Cohen and F. H. Portugal, "The Search for the Chemical Structure of DNA," Connecticut Medicine 38,551-557 (1974). 7. 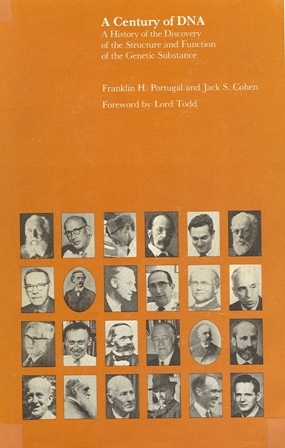 J. S. Cohen and F. H. Portugal, "A Comment on the History of Biochemistry," Perspect. Bioi. Med. 18,204-207 (1975).